With 97 percent of precincts reporting in Arizona, John McCain has been declared the winner of Tuesday’s GOP primary. According to the Arizona Secretary of State website, McCain won with 51.76 percent of the vote, compared to 39.09 percent for Dr. Kelli Ward. Alex Meluskey, who dropped out earlier in the month, was still listed on the ballot and received 5.52 percent of the vote, while Clair Van Steenwyk garnered only 3.63 percent. Tonight we concluded an amazing chapter in our lives. Along the way, we have met thousands of wonderful people who have sacrificed incredible amounts of time, talent, and treasure to help me stand up, step forward, and speak out in support of the conservative values that founded and sustain this nation. Sadly, the establishment has won this battle by spending untold millions to call me liberal, dangerous, weak, and, most recently, crazy. As Senator McCain said, “It shouldn’t be beyond us to refrain from substituting character assassination and mean-spiritedness for spirited debate.” After refusing to debate while running a slash and burn campaign devoid of actual ideas, I hope the Senator can rest comfortably with his conscience as he continues to lecture others about civility. The Republican party cannot win as a national party if we keep nominating unprincipled career politicians whose only objective is perpetual re-election. I am confident that our movement to save America will continue– those of us who believe that “Liberty ought to be the direct end of Government” as Patrick Henry wrote. As Edmund Burke, the philosophical founder of conservatism said, “Nobody made a greater mistake than he who did nothing because he could do only a little.” We have fought the good fight, we have finished this race, we have kept the faith. This battle is done, but the war for America’s soul will certainly continue. This is only the end of the beginning. Ward received a boost in the last month, with high-profile endorsements and financial support from Robert Mercer in the form of a $200,000 contribution to a Ward-supporting PAC, according to Politico. 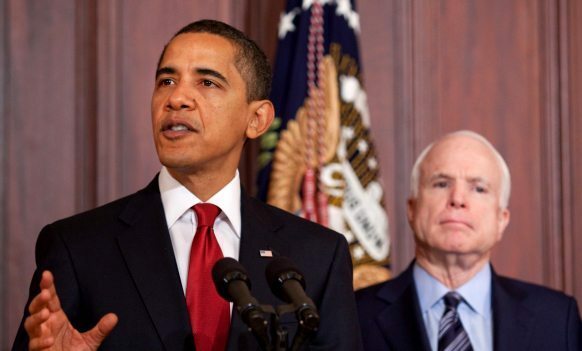 The publication also noted that the PAC helped fund a $600,000 ad campaign attacking McCain. Several Arizona state legislators endorsed Ward last December. Rep. Louie Gohmert, former Rep. Tom Tancredo, and Mississippi State Senator Chris McDaniel, Rep. Thomas Massie, Rep. Jim Bridenstine, Virginia State Senator Richard Black, former Rep. Ron Paul, conservative leader Phyllis Schlafly of the Eagle Forum, Tea Party Patriots leader Jenny Beth Martin, talk radio host Laura Ingraham, and three parents who have each lost children at the hands of illegal aliens joined Ward’s endorsees. She also picked up the endorsement of former Reagan official Bay Buchanan on Monday, who announced of her endorsement in the Daily Caller. Ward told the Arizona Republic she’s not certain if she’ll support McCain in the general election against Democrat Rep. Ann Kirkpatrick. McCain, who just turned 80 and is viewed by many conservatives as too liberal on issues like immigration and gun control, is seeking his sixth six-year term in the Senate.